When my girl was just a wee bub I would rock her in my arms for hours, but these days she prefers to rock herself. 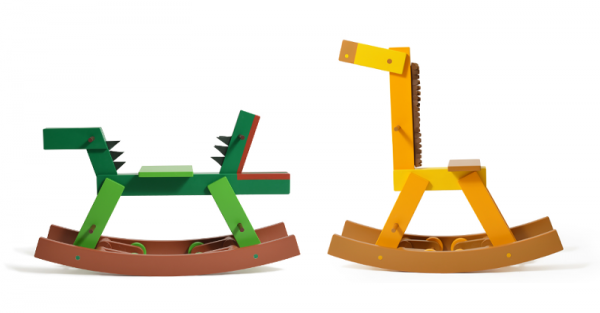 When I saw these stunning rocking animals made by Italian designer Luca Boscardin, I fell in love. Yes, my baby loves to rock and I love seeing her gleeful expression as she swings herself back and forth. If you know a kid like mine who loves a fun rocking animal then they are sure to adore these creative creatures in the Cavalcade collection. Each piece is crafted from a single piece of wood and lovingly assembled and painted in Amsterdam. The design is by Luca Boscardin who also designs for some of our favourite luxe toy brands like Kidsonroof and Peridea. 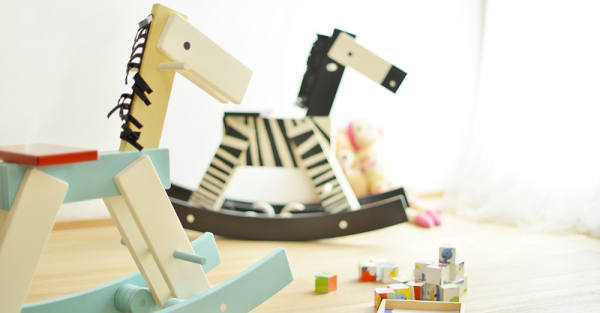 Each animal can also come with wheels in place of rocker if your wee one likes to zoom about. What I love most about Cavalcade is they go beyond the regular rocking horse into more imaginative designs. Know a few kids who would rather ride a crocodile, or a tall giraffe, or a deer complete with antlers? They are all there in the Cavalcade of animals. Unfortunately this fabulous modern version of a classic toy is not yet available for purchase. But fear not, I have my ear to the ground for these beauties and will let you know once they are released. If you love quality wooden toys you might like this sweetheart wooden pram, or iconic Australian wood blocks, or even this sleek wooden bike rack.